Location for new melon & pumpkin seeds when planted...? 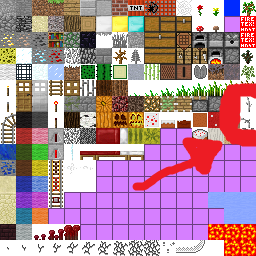 I'm updating my homemade texture pack and I'm having a bit of trouble tracking down the images for melon & pumpkin seeds when they're planted / growing. Right now they're big green x's with the little seed/sapling guys growing out of them so obviously I'm doing something wrong. Are they on the terrain.png and I somehow missed them? Any help would be greatly appreciated. When it's small it's only the tip and it gets recolored, as it grows it moves up and changes color.